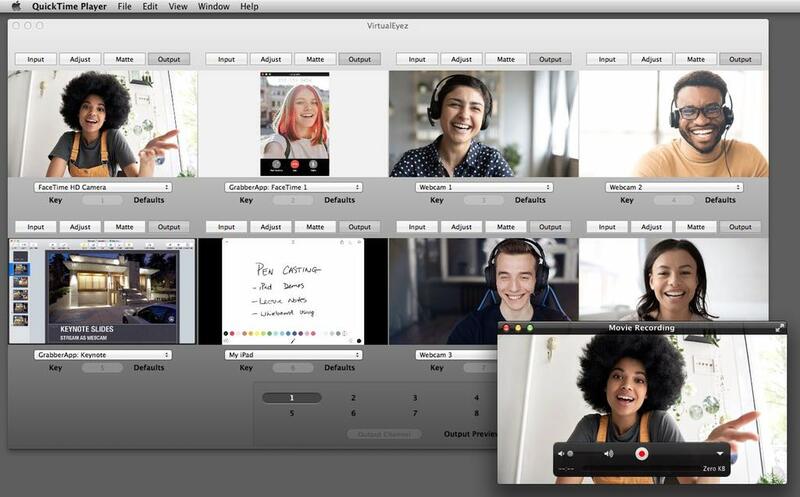 Adds greenscreen removal to most webcam-enabled Mac applications. Takes 4 cameras in and creates a new virtual webcam with the "keyed" video. The VirtualEyez camera input appears inside Google Hangouts, Skype, Safari, Photo Booth, etc. as a new virtual camera input. Go live on Saturday Night using nothing but your Mac, a weird green bedspread discovered in your Uncle's garage and a copy of the January 1974 issue of National Lampoon for inspiration. Even if your YouTube videos are decidedly unfunny, they will impress your mom! She'll bake you cookies and forgive you for that time you melted cheese into her favorite doily. 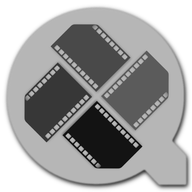 Supports Hollywood-grade keying methods: chroma-key matte (arbitrary color removal) and Luma-key (bright and dark region removal). Record your live greenscreen performance directly to YouTube. Or VJ mix using CamCamX for an instant live TV studio in your Mac. 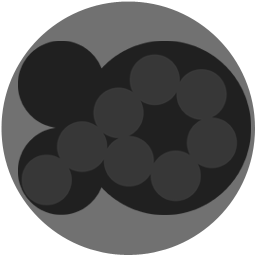 Can also be combined with DotMatrix and Q@mera for that cheap-o-matic FX explosion. So much easy pop art you'll be seriously considering asking that Doc Marten-wearing cutie out on a date. 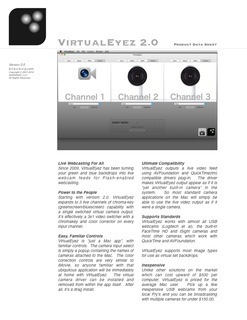 For further details, take a look at the VirtualEyez 2.0 datasheet. As an existing customer, you're entitled to upgrade pricing. VirtualEyez is very easy to use. Download the disk image and review the short PDF instruction manual. VirtualEyez 2.0.10 is the current version, released 2015.07.01. 2.0.10 adds 4th input channel and integrated grabbing. 2.0.8 fixes bug with alpha on image backgrounds (minor update for 2.0.7). 2.0.7 fixes bug with image backgrounds which are not pre-sized to 640x480. 2.0.5 includes minor bug fixes. 2.0.4 includes compability with sandbox Safari under Mountain Lion and Mavericks. Up to 3 Camera inputs. Low-latency CMIO and VDIG drivers compatible with Safari and other great apps for Mac. MIDI input for external control surface input switching. Other cool features too numerous to mention. 1.506 includes improvements for Lion and Mountain Lion (GateKeeper / DeveloperID).